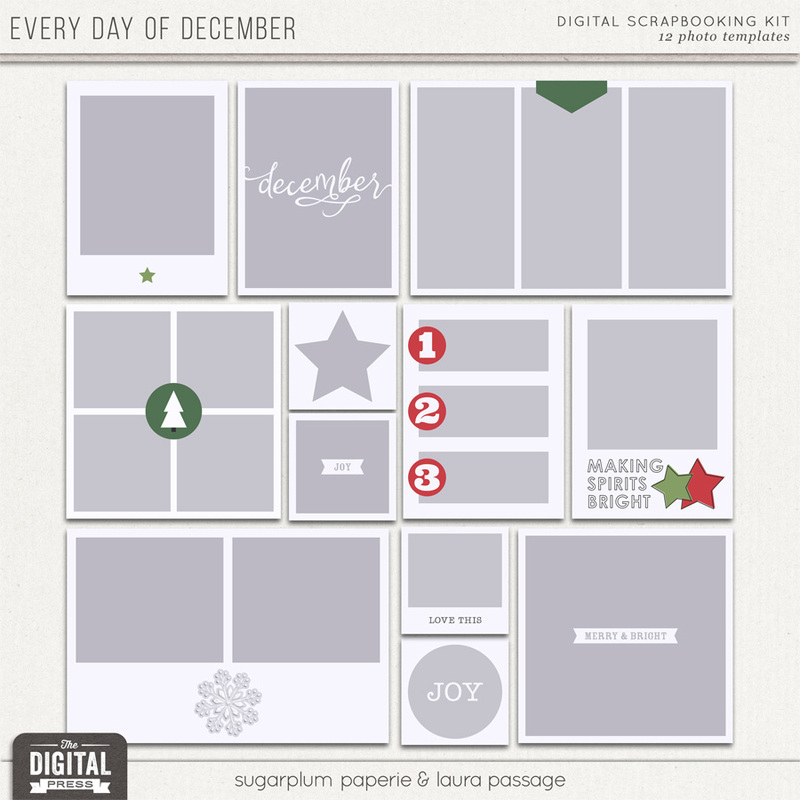 Happy holidays, everyone, and welcome to Day Three of our annual 10 Holiday Tips & Tricks series here on The Digital Press blog! 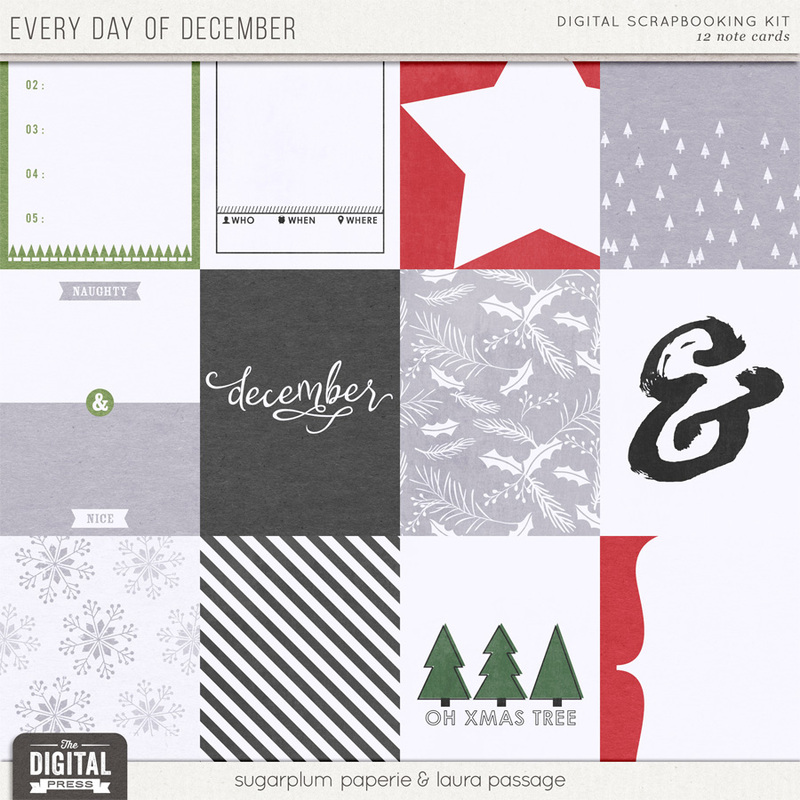 Today I’m here to share a few ideas for using your digital papers and elements to make some festive holiday tags. I love making tags; I use them on packages & gift bags, bottles of wine, and sometimes I even hide gift cards in them. I also like to use them in my pocket pages in my scrapbooking albums (often, the smaller sizes fit nicely in a 3×4 pocket, or attached to a larger journal cards). 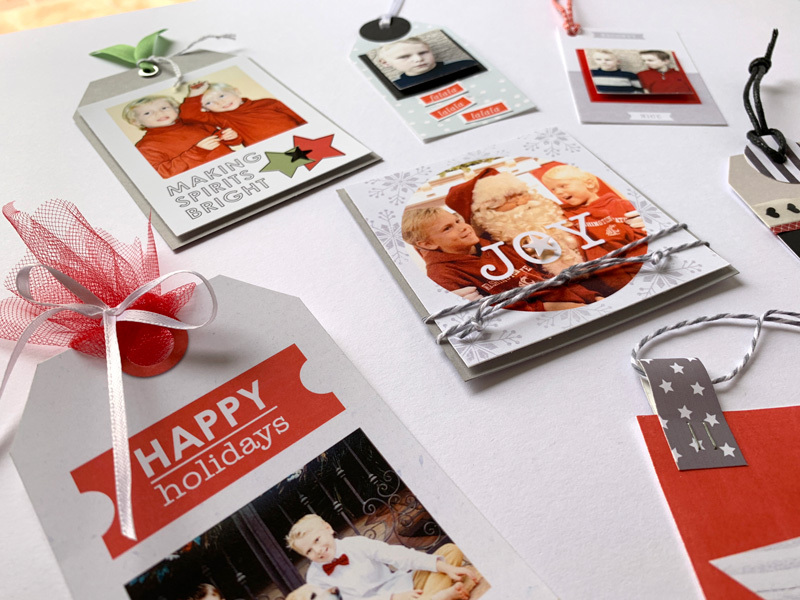 For today’s project, I am going to to show you how to create some photo-based tags (for memory-keeping purposes), and also some gift tags (for wrapping purposes). 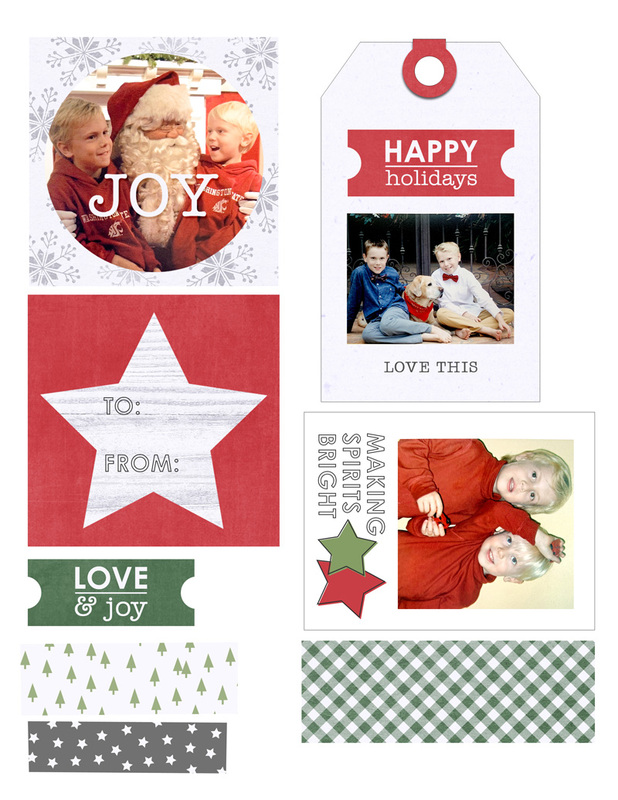 First, I took out a few of my old Christmas cards from when my kids were little, and snapped a few photos. 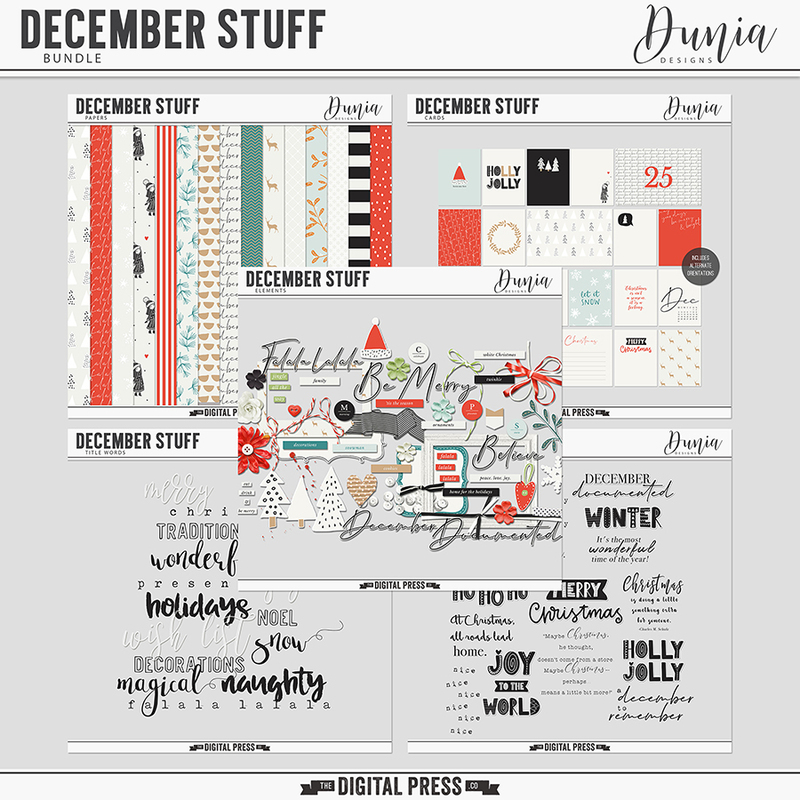 Then, using Photoshop Elements (PSE), I attached the photos to some of the blocks on the templates (Ctrl-G in PSE; Ctrl-Alt-G in PS)… and I also picked some cute patterned paper and elements to attach to others. Once I had the templates filled, I printed it all on 8.5″ x 11″ white matte presentation paper. I usually add a stroke around each item make it easier to see the edges for cutting. I wasn’t exactly sure how I was going to use everything; the process was just to print things that I could easily cut or punch and then play around (and it was super fun)! 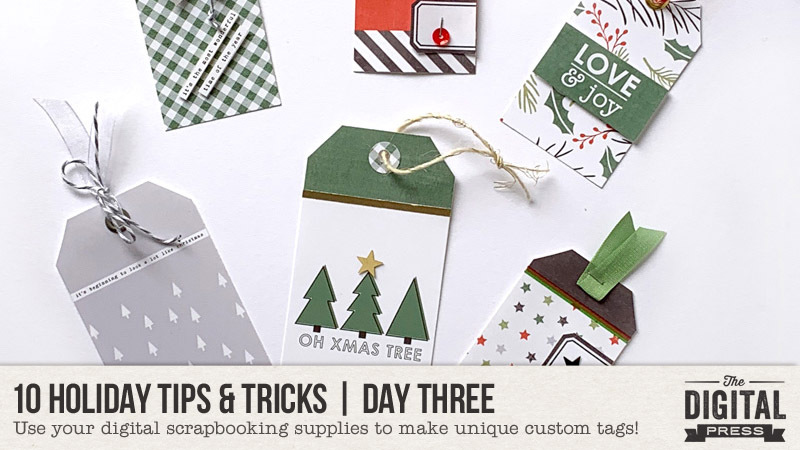 Once I had everything cut out, I started assembling the tags… which came together quickly! First I added ribbon, bows, and twine. For dimension, I used glue dots to add some stars I had in my scrap stash. As you can see, above, if you compare my print sheet to the original journal cards/etc… on some tags I wanted the top of the tag to be in one color, and the body of the tag in another… so I just clipped the two papers and moved them up or down in Photoshop until I got them each where I wanted to create the two-tone effect. Then, after adding a stroke around each tag (again, to give myself a handy cutting line, once printed)… I printed them on an 8.5″ x 11″ paper and cut them out. 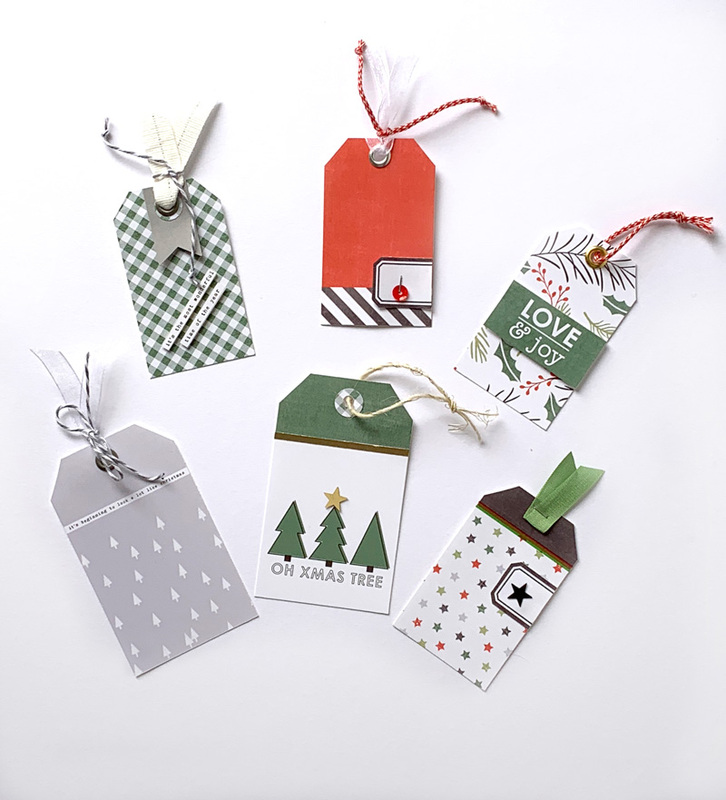 I fell in love with the little doodled trees… so I decided to use them as embellishments on a bunch of tags. 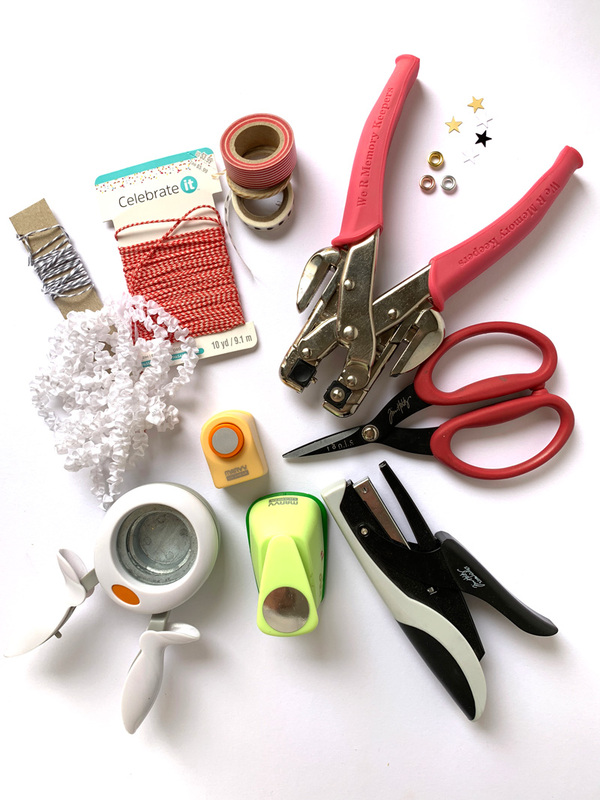 I did have to cut each of these items out by hand — and I am not perfect at “fussy cutting” — but it was quick and easy! 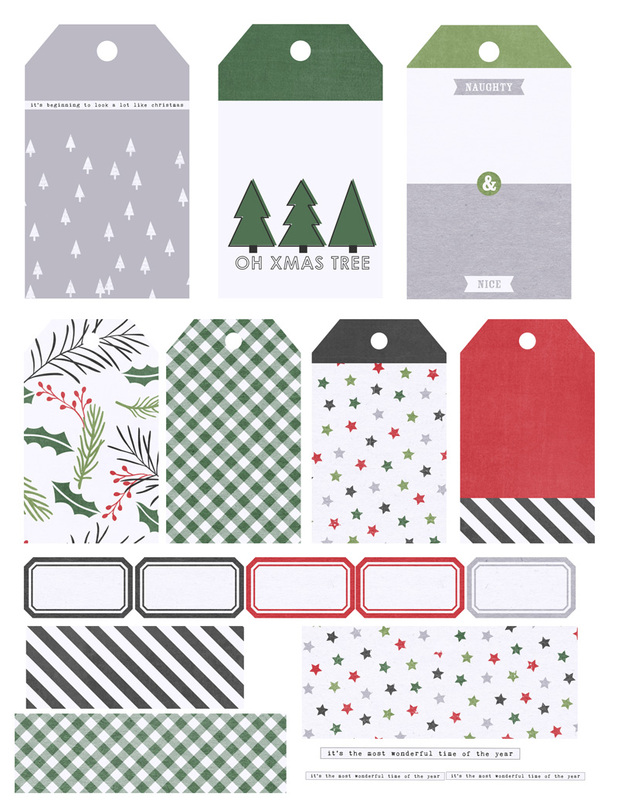 *TIP* — on the trunks of the trees in the top row of tags, you can see the little bit of “naughty and nice” word art that came in the kit. 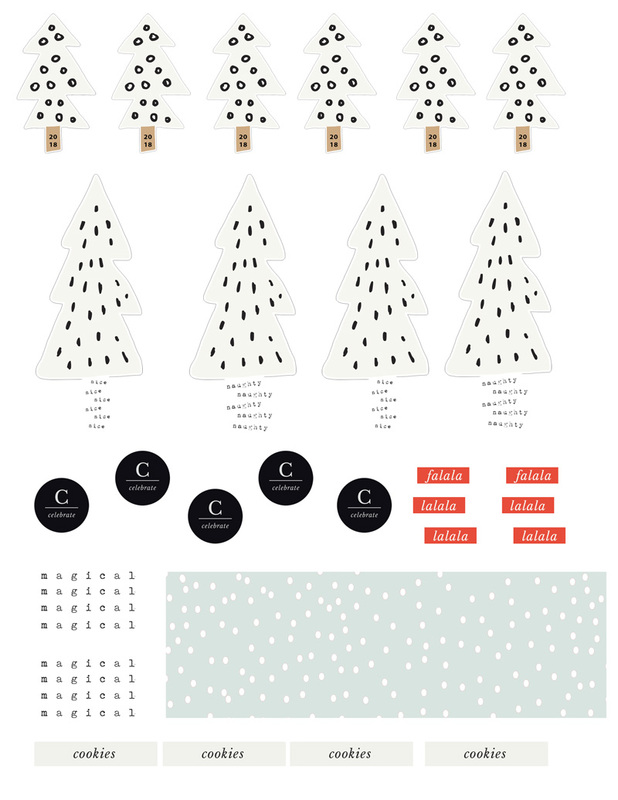 I added it to the trees, creating my own custom trunks, by layering it and clipping it to the tree shapes in PSE — super easy, and a great way to add just a bit more interest (plus, “naughty and nice” is perfect for life around here)! In this same way, I also put the year “2018” onto the tree trunks of the smaller tags in the bottom row, as well. 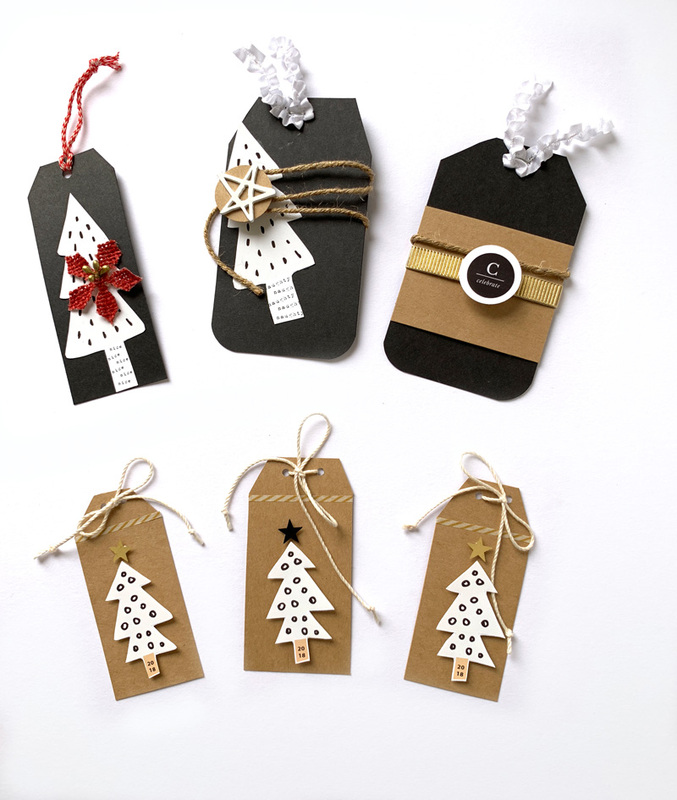 I felt like I had a lot of kraft paper on the smaller tags… so rather than adding another patterned paper, I broke things up by using a thin strip of some washi tape. 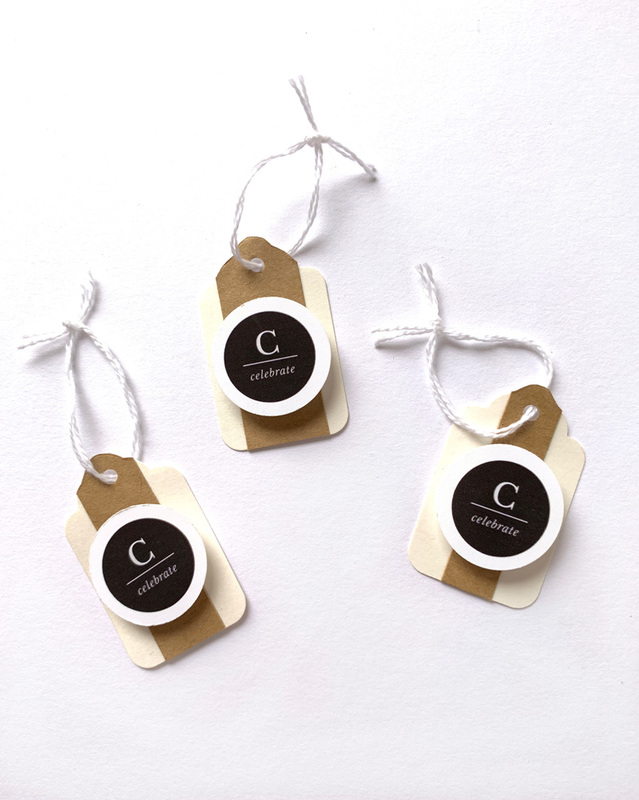 Finally, for one last project… I had some very small cream-colored tags laying around in my physical stash for years, and I thought this would be the perfect opportunity to use them! I knew they would be perfectly-sized to put around a wine bottle or box of chocolate to give to girlfriends and neighbors. For these, I just punched out some more 1 inch circles from various patterned digital papers that I printed out, and then I attached those circles to each tag. On top of the circles, I added each friend’s first initial with some chipboard letters, and a topped it off with a small star or sequin and some ribbon. I think they are going to like this bit of customization on their gifts! 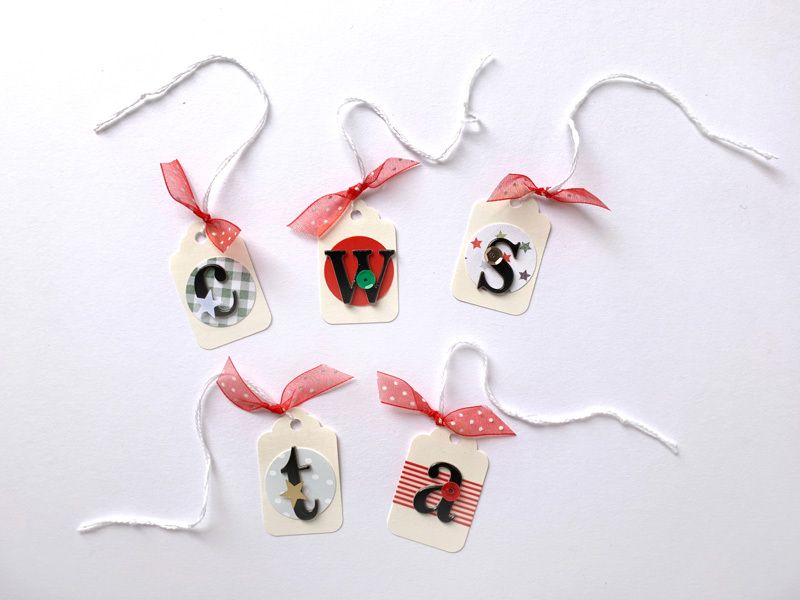 I also used a punch for some of the word art (“celebrate”) that I found in the kit… and added that to these small tags. I thought these might be nice for New Years Eve. 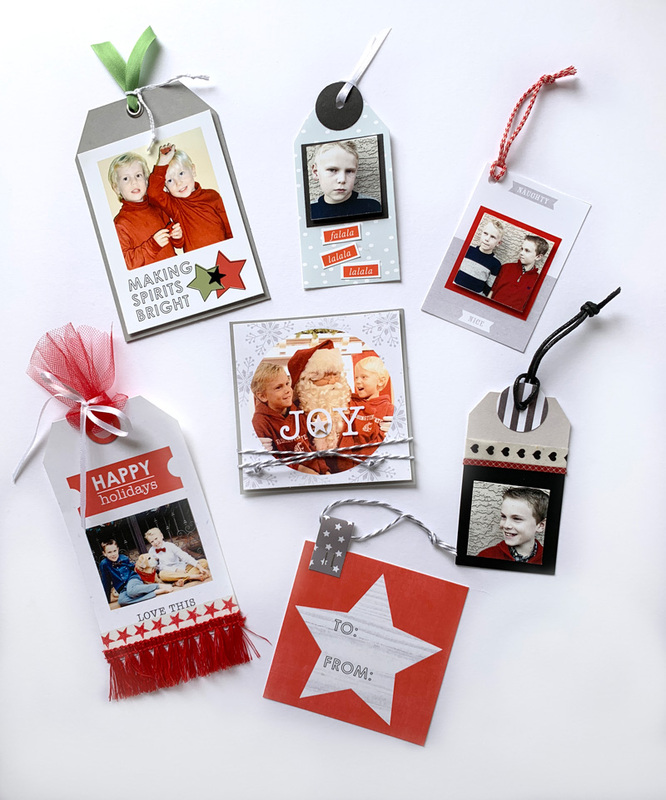 I hope I have inspired you to print out a few papers and elements and put together some tags this holiday season. This was seriously a fun and therapeutic project for me — and I know I’ll be so glad I’m getting it done early in a couple of weeks when things get really hectic!